You read that correctly. There is a library in Avalon. No, not King Arthur’s Avalon — but the city of Avalon on Santa Catalina Island off the coast from Los Angeles. It is not part of the Los Angeles Public Library LAPL, which this blog is focusing on, but part of the County of Los Angeles Public Library. I’m taking a detour to talk about it since I just so happened to be on the island with my family over the weekend for a friend’s 40th birthday. And we had to visit! What’s amazing is that besides the 72 LAPL branches, there are 85 branches in the County of L.A.! There’s an idea for another blog . . . I hope someone does it. We were lucky to meet the Avalon Community Library Manager, Morgan, while browsing the books in the children’s corner. Morgan was getting the outdoor area ready for a Cinco de Mayo piñata and a dance performance. The performance by the Ballet Folklorico Quetzal was terrific. The children who had come to read after school seemed to all stay for the outdoor festivities. I loved feeling right at home in an “overseas library”. All of the librarians and staff were helpful and more than happy to let us hang out. 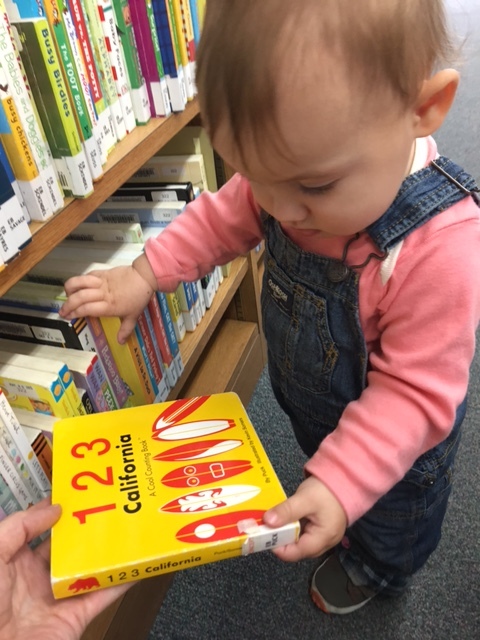 We didn’t check out any books (I’ve actually never gotten a county library card, shameful I know – it’s so easy to do) but we looked through a few books together including 123 California A Cool Counting Book by Puck and Illustrated by Kevin Somers. My husband John read Riley one about the seashore called It’s A Seashell Day by Dianne Ochiltree and Illustrated by Elliot Kreloff. Fitting for story time on an island. John is the best at making voices for people and animals in stories. He’s also quite talented at making up songs to sing to our daughter. . . he is the artist in the family. I hope Riley gets his skills. Besides trying to pull books off of shelves, Riley found the headphones at the Early Literacy Station very exciting. She also fell in love with the super friendly cat who hangs out by the library. Just more evidence that cats and books go well together! If you’re ever in Avalon, make sure to visit the local library. I was hoping to find a story about Old Ben by a local author – but maybe someone’s writing it right now. Old Ben The Seal of Catalina. I would read it. Next time we are on Catalina, the library will definitely be on our itinerary again. And the next time I’m in a County of L.A. library – I will sign up for a library card. Who doesn’t need 85 more branches to visit? Megan, what a great idea to visit libraries! I have planned to take Sky to different playgrounds around our area to meet children from different backgrounds and which have different play equipment and structures. to develop his muscles and imagination. I/we like children’s books, too. El has been President of Friends of the Library and held other volunteer positions. I volunteer on Tuesday afternoons at our local library, West Valley branch, 3:30-5:30. They call me Miss Hare, one of the two Star Volunteers. They made me a great giant green apron with big pockets to hold pencils and reading cards–when the children get 3 stars signed on their cards, they win a book of their choice, a gift from the library. I read to them or they read to me, or sometimes we go back and forth and share the reading. They pick the books which we read. Sometimes I have a whole group to which I read and sometimes it’s one on one. Sometimes there’s a whole bunch of children, sometimes only one or two. I just noticed this week that there’s a big vertical Legos board attached to one of the bookcase edges with a box of Legos to make 3-D leaping-out-of-the-wall constructions and a chalk board on the edge of another bookcase and they use Kleenex as an eraser. Funny, I’d never noticed these two areas before. There are little round tables and chairs to use and also a carpeted amphitheatre that they like to sit on for their reading or leap around on and jump off and on. There’s also a colorful carpet with numbers and letters and creatures. In addition to books, they have videos and DVD which can be check out, and there’s a globe available. Kids who come from other parts of the world especially like that. I wonder if anyone ever made a metallic globe to which flexible magnetized trains, planes, ships and cars could be moved around. The kids’ area is a great space for children and no one comes around and shushes them. 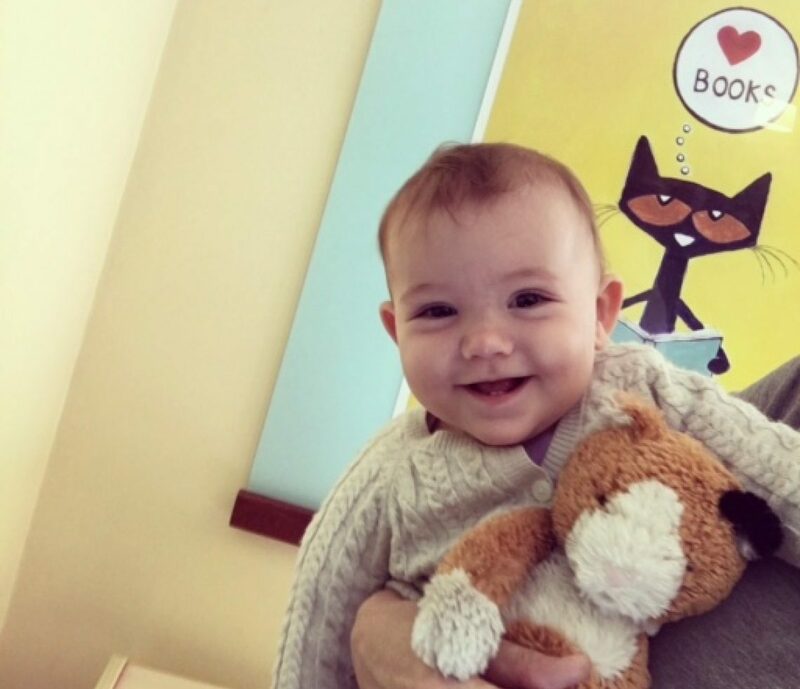 I love to see your pix of Riley as you and John read to her–she looks so intent. Sky has all this to look forward to–he’s 6 months old now and loves the books which he can squish and chew (he’s teething) on and make wonderful delighted sounds. Well, have fun as your family continues touring your city and county libes.